I interact with a lot of fundraising executives representing institutions of all sizes and degrees of success—from the largest hospital network in the North America to small shops with two or three fundraisers. It would be a mistake to assume that very large organizations do all things very well while the very small always lack resources to implement a good fund development strategy. Sometimes it works that way; often it does not. When it comes to maximizing an organization’s funding potential, there seems to be little if any correlation between size and effectiveness. It has more to do with a consistent philosophy and leadership team along with clearly defined roles and responsibilities. Lately I’ve been thinking about the similarities between fund-development teams and sports franchises. We live in Nashville where last month our National Hockey League franchise, the Predators, advanced all the way to the Stanley Cup Playoffs. The enthusiasm, expansion of the fan base, and the general momentum of a run deep into playoffs have been quite astounding. Season ticket sales for the 2018 season have tripled. People are investing huge amounts of their discretionary income to follow and cheer for the Predators. When it comes to maximizing an organization’s funding potential, there seems to be little if any correlation between size and effectiveness. Nonprofit boards of directors are like a team’s ownership group. The various levels of nonprofit leadership correspond to general managers, coaches, directors of player personnel, scouts, sales & marketing directors, and support staff. Donor groups are like fans—skyboxes (corporate donors), season-ticket holders (major and habitual donors), single-game ticket sales (occasional donors), and fans who wear the team gear and watch on television (potential donors). The game being played on the field (or on the ice) is the organization’s program. 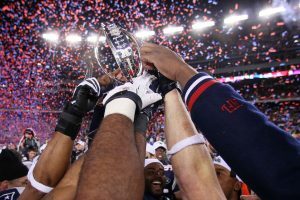 Fans and followers (donors) invest their time and hard-earned money (discretionary income) to share in the excitement of a winning team. You can see the how these dynamics apply in a 16-year comparison of two National Football League (NFL) franchises—the Cleveland Browns and the New England Patriots. My apologies to Browns fans who have suffered through so much and to those who despise the Patriots for their perennial success. Nonetheless, these are facts. In 1995 Browns’ owner, Art Model, moved the successful Browns franchise to Baltimore and renamed the team the Ravens. Four years later in 1999, the NFL expanded, locating an expansion franchise in Cleveland with the same name—the Browns. That was great news for the Cleveland faithful. The new franchise, however, has thus far proven to be the most dysfunctional in the NFL’s recent history. Since that inaugural season, the Browns’ record has been a dismal 189 losses and 87 wins, the worst 17-year record since the NFL expanded to a 16-game season in 1976. To make matters worse for Cleveland fans, the Browns’ former head coach, Bill Belichick, was hired by the New England Patriots in 2000. In his first season, the Patriots won only 5 games against 11 losses. Since that first losing season, however, the Patriots have become the most successful franchise in the NFL. In order to create parody among the franchises, draft picks are awarded by the record from the previous year—worst teams pick first. Since 1999 the Browns have “earned” one of the top three selections seven times. The Patriots have had no top three picks in the last 16 years. To prevent teams from establishing a winning tradition by simply outspending their competitors, the NFL has a salary cap. 1) Consistent Leadership—Bill Belichick has the longest tenure among all NFL coaches while the Browns have hired and fired nine head coaches since 2000. 2) Player Personnel—They know what kind of players will and will not work in their system. 3) Proactive Process—They have a clearly defined and successful philosophy that they follow. They are proactive, not reactive. 4) Unconventional Moves—A proactive process is not necessarily conservative. The Patriots have a history of making bold decisions to retain or release key personnel. 5) Organizational Culture—When it comes to hard work and extreme preparation, the Patriots’ are considered to have a self-policing accountability system within the locker room. 6) Career Potential—While Cleveland is considered a potential career killer (especially for quarterbacks), players are often willing to take less money to be a part of the Patriots—beginning with the most valuable player quarterback Tom Brady. The result is that the New England Patriots are perennial winners with hoards of raving fans. Nonprofit organizations are not exactly the same, but quite similar in one particular way. Most of the factors that contribute to winning or losing traditions are directly related to Human Resources— what type of players will fit within their system, when to bring on more personnel, how to define their roles, and how to support and develop their skills. In other words, organizational success is about hiring the right people at the right time in the right roles with the right job descriptions.